Personalize a wine glass, mug, Yeti, laptop, cell phone case, notebook, even your car! These fun decals are easy to apply but are made from heavy duty, outdoor vinyl making them durable and lasting. Decals are approximately 3 inches x 3 inches and standard color is BLACK. Additional colors can be requested based on availability. See chart in photos for options. Custom decals are available and start at $5.00 per 3x3 decal. Larger sizes or multiple colors are extra. Use the Custom Order Request option to send me your custom request. 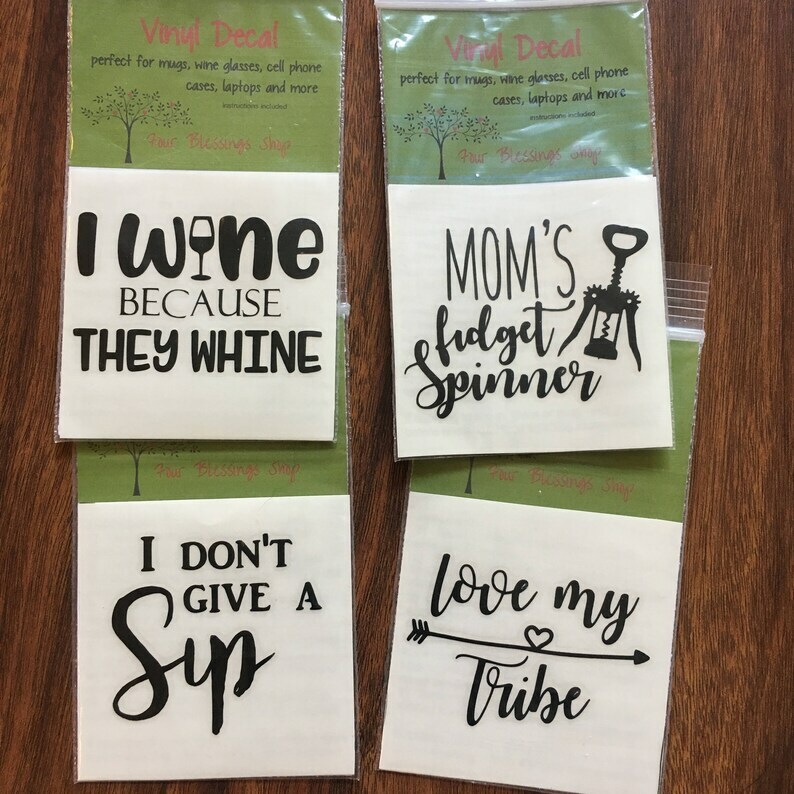 Apply these decals to a dollar store item for a cute and personalized gift for teachers, friends, moms, neighbors....the possibilities are endless. SHIPPING: You will receive an email with shipping confirmation and tracking information when the item ships. Once the item is received by the post office, I can no longer control its whereabouts. If you have problems with delays in delivery, damaged or lost packages, please contact the PO. Was very excited to receive them just in time for a Christmas party. So far, one of the decals worked & looked great. Another one seemed to be defective as it wouldn't come off of the white paper, onto the clear. Can't use it. The other 2 I ordered - I'm not sure. the ladies haven't tried yet. love this item, shipped on time!